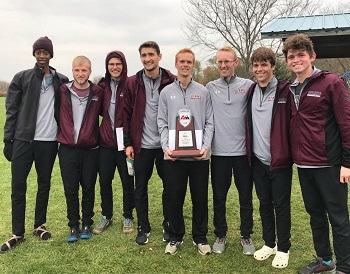 It was a great Saturday for College of the Ozarks men’s and women’s cross country teams, who traveled to Bettendorf, Iowa to participate in the 2018 A.I.I. Conference Championship. The Lady Cats captured the 2018 A.I.I. Women’s Cross Country Championship with a first place victory over the four teams competing at Crow Creek Park. The Lady Cats put up a team time of 1:45:07 in the 5 kilometer race, with four runners crossing the line in succession. Haskell Indian Nations University followed a full minute-plus behind the Cats, and Indiana University and Crowley’s Ridge College finished 3rd and 4th respectively. Sophomore Adeline Holder was named 2018 A.I.I. Women’s Cross Country Runner of the Year, as she finished in first place with a time of 20:36.7. Three of her teammates finished directly behind her. Bethany Marteney took 2nd place (20:41.8), Bethany Edgar finished 3rd (20:45.0), and Hannah Duncan came in 4th (21:18.1). Naomi Murrell, Aspyn Britt, and Mary Zimmerman finished 9th-11th out of 34 runners participating. The men’s race followed, and sophomore Bobcat Sam Baumer finished in first place out of 36 runners. Baumer posted a time of 26:44.5 in the 8 kilometer race and was named 2018 A.I.I. Men’s Cross Country Runner of the Year for his efforts. Senior Shane York (27:06.4) took 3rd, and Garrett Pierce (27:10.6) was 4th. The Bobcats’ team times were rounded out with Wesley Moore and David Byrd finishing 13th and 14th. As a team, the Bobcats finished in second place with a time of 2:18:34, missing first place by only 3 points, with their team time trailing just four seconds behind Haskell Indian Nations University. York, Pierce, Moore, and Baumer have all qualified for NAIA national competition. Lady Cats Holder, Marteney, Edgar, and Duncan, alongside Bobcats Baumer, York, and Pierce were named All-Conference First Team, Lady Cats Murrell and Britt were named Second-Team All-Conference. York and Murrell were both awarded A.I.I. Champions of Character. Bobcats’ Clint Woods was honored as the A.I.I. 2018 Women’s Cross Country Coach of the Year. Next week, College of the Ozarks will host and participate in the NCCAA Division I and Division II Men’s and Women’s Cross Country Nationals on the campus at Point Lookout, Mo. Men will race at 10:00 a.m. and the women will race at 11:00 a.m. Admission is $5 per vehicle. The following week, the women’s team, along with Bobcats Baumer, York, Pierce, and Moore, will advance to the NAIA National Championships in Cedar Rapids, Iowa.